Aerial weather reconnaissance by the Army Air Forces began in earnest in 1943 when the First Weather Reconnaissance Squadron, flying B-25s, began weather recon flights on the North Atlantic ferry routes. By 1944, a mixed bag of TB-17s, B-24s and modified B-25Ds were flying a variety of weather reconnaissance missions in the Atlantic and the Pacific, including the penetration of hurricanes and typhoons. In January of 1945, the 655th Reconnaissance Squadron, flying B-24s, was established on Guam and assigned specifically to support XXIst Bomber Command operations. Prior to the formation of the 655th, target and route reconnaissance for bombing missions over Japan was conducted by combat B-29s assigned as pathfinders and carrying a trained weather observer. The first B-29 weather scout mission over Tokyo occurred on 8 Dec 1944. 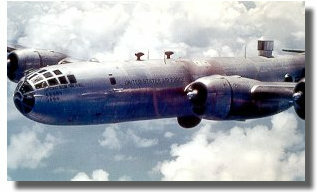 By mid-1945, parachute-deployed dropsondes and other unique weather analysis equipment had been tested aboard B-29s of the 73rd Wing on Saipan. The results had not yet proved conslusive when the war ended, and further experiments were put on hold. On 22 Aug 1945, the chief of the Air Weather Service recommended that the AAF activate two weather reconnaissance groups with eight squadrons. Demobilization was the buzzword at the time, however, and his request was denied. A year later, the AAF determined that the recommendation had merit, and transferred all AAF weather reconnaissance assets to the Air Weather Service. By this time, unfortunately, the "assets" consisted of precious few worn out aircraft and four squadrons. The 53rd Squadron, then based in New Hampshire, was operating TB-17s. The 54th and 55th Squadrons existed on paper only. The 59th Squadron, based at Castle Field, Calif., had recently received a number of B-29s, three of which were earmarked for weather recon duties in support of the upcoming atomic bomb tests at Bikini Atoll. In March of 1946, the three B-29s of the 59th had a variety of weather instruments installed at Tinker Field, and then departed for the Pacific and "Operation Crossroads". 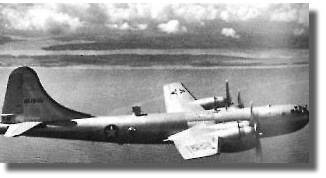 On 25 May 1946, another B-29 of the 59th flew the first "synoptic" weather reconnaissance mission from Castle out over the northeastern Pacific. 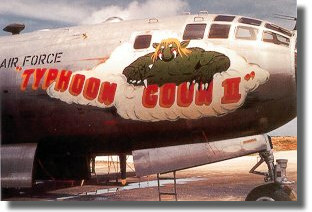 By 1948, all four squadrons had been upgraded to B-29s, which by this time had been redesignated RB-29. The 53rd had moved to Bermuda, the 54th had moved to Guam, the 59th relocated to Alaska, and the 55th set up shop at Fairfield-Suisun Field near San Francisco. After a bewildering round of activations, de-activations and re-organizations, AWS finally arrived at a six-squadron table of organization in 1951. The 53rd and 54th remained where they were; the 55th had moved to McClellan AFB, near Sacramento; the 56th was based at Yokota, Japan; the 57th settled in at Hickam AFB, Hawaii, and the 58th shivered at Eielson AFB near Fairbanks, Alaska. Other than the 53rd's relocation to England in 1954, and the reactivation of the 59th in Bermuda, this structure remained intact through the late 1950s. The AWS fleet of RB-29s was a mixture of B-29s and B-29As, all with 1944 or '45 serial numbers. By mid-1949, forty-six of these had been modified to RB-29 with various weather equipment installed, while seventeen others remained in standard configuration and were used for crew training. All these aircraft were weary and difficult to maintain, and the old B-29 bugaboo, engine fires, still plagued the fleet. In November 1949, AWS grounded the entire fleet until all the engines could be replaced with modified post-war versions. Other maintenance problems continued, however, and the number of "mission-ready" aircraft was barely enough to meet the tasking orders. AWS investigated the possibility of obtaining new aircraft, but considering their low priority and lack of funding, it was simply out of the question. Thus began a program of standardizing and modernizing the entire B-29 fleet. All new engines and Curtis electric propellers were installed; all the infrastructure of turret control and weaponry was removed, in addition to all the bombardier equipment. In place of the bombardier position, a new weather officer's position was created, and a newly-developed dropsonde ejection chamber was installed in the rear scanner position, along with a table and seat for the dropsonde operator in the starboard scanner location. Additionally, a 640-gallon fuel tank was placed in each bomb bay, and the atmospheric sampling "bug catcher" was installed where the aft-lower turret had been, along with an access panel so that sampling filters could be changed in flight. Other modifications included new radar, a radar altimeter, and improved radios. All these modifications were completed by mid-1951, and for the first time the AWS operated an entire fleet of relatively modern aircraft equipped with state-of-the-art reconnaissance equipment. All the AWS B-29s and RB-29s were subsequently re-designated WB-29. While still not an ideal reconnaissance platform, the WB-29 was a workhorse and proved to be a relatively safe and reliable aircraft. southeast of Bermuda. 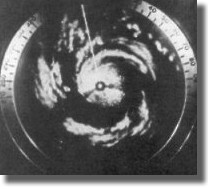 This flight determined that penetrating tropical storms at lower altitudes was a reasonably safe activity, and all future penetrations were conducted at similar levels. The mission was not without it's hazards, however. Between 1945 and 1956, AWS suffered 8 major accidents with the B-29, resulting in the loss of 58 crewmen. The first loss of an AWS aircraft occurred on 26 Oct 1952 when all ten members of a 54th WRS WB-29, *Typhoon Goon II*, were lost during a low-level penetration of Typhoon *Wilma* some 300 miles east of Leyte. 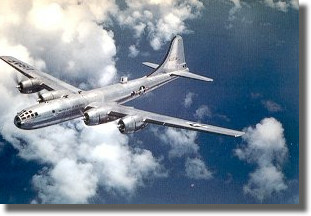 While the B-29's "public" mission was that of weather reconnaissance, the "covert" mission, that of atmospheric sampling for radiation debris, was perhaps the more critical task. Each aircraft was fitted with air sampling scoops, called "bug catchers" by the crews. The first sampling scoops were fitted beneath the wings; later they were installed below the aircraft fuselage; the final version, which was also carried over to the WB-50, saw the "bug catcher" mounted where the aft upper turret had been. These scoops had paper or cloth filters within, which collected particulate matter from the airstream passing through. Filters were changed at regular intervals throughout the mission, and were analyzed for radioactive debris on the ground after the flight. In May of 1949, AWS established a "routine" daily weather reconnaissance track from Eielson AFB, Alaska, to Yokota AB, Japan. The reverse track was flown the following day. While these missions did collect weather data, the *raison d'etre* for these flights was to "sniff" for radioactive debris. It was known that the Russians were feverishly at work on their first atomic weapon, and it was imperative that we find out about it as soon as possible. On 3 Sep 1949, after a routine return track from Yokota to Eielson, analysis of the filters revealed an inordinate amount of radiation. Much study and investigation ensued, while other AWS RB-29s chased the radioactive cloud across Canada and into the United Kingdom. Detailed analysis proved that the debris that had been captured were from an atomic weapon that could only have been exploded by the Soviet Union. "The detection of these radioactive samples, obtained by a B-29 operating under the guise of a weather plane, electrified the military" wrote Chairman of the Joint Chiefs of Staff Omar Bradley. Later that month, after much political wrangling, President Truman announced the event to the public. The success of the mission of 3 September assured the AWS a high priority for funding and equipment upgrades for years to come. Had there been any lingering doubts about the efficacy of aerial sampling, they were dispelled on 12 Aug 1953 when an AWS WB-29 detected the fallout from the Russian's first hydrogen bomb test. John Fuller wrote: "So vital was such intelligence that aerial nuclear sampling became a mission that carried more clout... with the Air Staff... than did weather reconnaissance in any form." WB-29s soldiered on through the mid-1950s, providing critical data on tropical storms, nuclear tests, and many other routine but important reconnaissance tasks. But the airplanes were weary, and the handwriting was on the wall. It was imperative that the WB-29 be replaced. Although AWS expressed a desire for C-130s to replace the aging B-29, Lockheed's amazing new airlifter was in much demand by every branch of the service. AWS still held a high priority with the Air Staff, but it simply wasn't possible to obtain brand new aircraft for a non-combat organization. Thus AWS was disappointed to learn, on 25 Jun 1954, that the Air Staff had ordered the modification of seventy-eight B-50Ds to WB-50 configuration. Although it was intitially assumed that the B-50 was merely a newer B-29, crews soon learned that it was quite a different airplane. Conversion to the WB-50 was a tragic comedy of miscalculations, maintenance nightmares, improper crew training, and ultimately, death. AWS operated the WB-50 for 11 grueling years, suffering 13 accidents with the loss of 66 crewmen. John Fuller wrote: "The widow-maker WB-50D was the blackest page in the annals of weather reconnaissance." The last WB-50 retired from AWS on 14 Sep 1965. By that time, AWS was in possession of eleven of the long-coveted C-130s. Between 1962 and the present day, forty-five WC-130s have been operated by the Air Force and Reserves, with the loss of only one aircraft and seven crew members. As this is written, brand new WC-130Js are being acquired by the 53rd WRS *Hurricane Hunters*, the only squadron still active. These aircraft will be the mainstay of the weather reconnaissance fleet for many years to come. Flying the Weather by Otha C. Spencer; The Country Studio, 1996. Info from Bob Mann, former Typhoon Chaser of the 514th and 54th WRS. Born and raised in northeastern Indiana. Graduated high school in 1966, attended Purdue University for two years, then joined the Air Force. After an interminable tech school at Chanute, reported to the 55th Weather Recon Sq. at McClellan AFB, CA. Was there a year, then reported to the 54th Weather Recon Sq. at Andersen AFB, Guam (formerly North Field, where the 314th Bomb Wing was stationed during WWII). It was here that I met the love of my life, the incredible Lockheed C-130 Hercules. I've been a HerkyNut ever since. While with the 54th I logged five typhoon penetrations, 30 fog seeding missions in Alaska, and supported the rain-making operations in Thailand. Reached the end of my tour on Guam in December 1971, and as I had less than six months to go on my enlistment, was granted an "early-out". Returned home in January 1972, eager to resume civilian life. Met the other love of my life, Carol Jean, in 1972. We married in 1974, and last year celebrated 25 years of wedded bliss (well, almost). We have two daughters: Amanda, age 20, is a sophomore in college (on the Dean's list, too! ); and Melissa, age 17, is a sophomore in high school. .I work for one of the largest defense contractors in the country, as an electronics technician, and just recently celebrated my 20th year there. In addition to military and aircraft history, my hobbies include photography, building scale models, model railroading, electronics, and the Macintosh computer. To email Tom click here.